Strive Masiyiwa, Founder and CEO of Econet Wireless begins the series - The eagle in the storm. This is Part 1 - Intro. It is a must read. The new year opened with turmoil in the Chinese stock markets as prices fell dramatically, leading to a global selloff. In just one week, global stock markets lost over $2 trillion US dollars! Other news in the global markets saw the price of a barrel of crude oil fall below $35 per barrel, down from a high of $62 per barrel less than 12 months ago. That’s down 50% in 12 months and 71% in 24 months! Since the beginning of last year, 2015, the price of copper has fallen by 30%; iron ore is down by 42%; platinum has also been a disaster, losing more than half its value from less than three years ago. Agricultural commodities have not fared much better on global markets. Last week the South African rand hit an all-time low of 16:1 against the United States dollar and it’s still falling! Your small business in Harare, Lagos or Nairobi may not have anything to do with China, or with any commodity like oil, iron ore, or platinum, so you might be asking yourself, “What’s that got to do with me?” Answer: EVERYTHING! It has everything to do with you, and its impact is going to be very personal... Brace yourself, there’s a storm on its way! You might even be sitting at your desk as a civil servant, or supervising children at school as a teacher, or upholding the law as a policeman; or maybe you’re a pensioner, and you’re also saying to yourself, "I'm not in business; I don't know anything about these things, so what’s it got to do with me?” Answer: EVERYTHING! It has everything to do with you, and its impact is going to be very personal... Brace yourself, there’s a storm on its way! These are "signs" in weather conditions. Those who are experienced in such things can usually say with a degree of certainty that a storm is coming. However, if you do not understand these matters, or you blissfully decide to ignore them, you’ll suffer a serious drenching or worse. In business economics we also have signs, and we're seeing these warning signs right now. They're not any different from the black clouds and the wind, or the clear sky and the drought. They're all linked. The stock markets of China and New York may seem far away, and global commodity prices and exchange rates may seem irrelevant to your village, but they’re linked to the real economy in which you live and work! __There is a storm coming. Now let me tell you about the flight of the eagle. Prophets and Kings of the bible world absolutely loved watching this majestic bird. They believed the eagle is the only bird that flies during a storm. It's developed a flying technique (a skill) they call "mounting" the wind (as though it were climbing a stairway). The eagle has so mastered the storm that it not only flies during storms, but can find opportunities to prosper; it can actually use the storm to its advantage. Even in these storms, those with the correct mindset will prepare themselves. 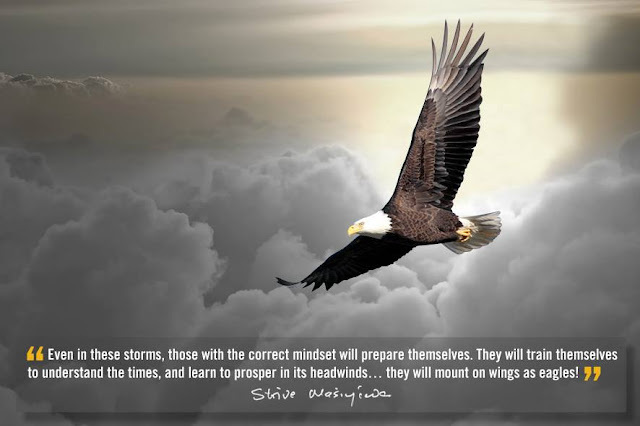 They will train themselves to understand the times, and learn to prosper in its headwinds… they will mount on wings as eagles! Yes, it’s going to be very tough, and for some of you, tougher than anything you could have imagined, but you must not be discouraged or wearied. And when you come through it, you will be much better at what you do. Just don't be afraid, and don't panic. In this series I will remind you of some of the things you must do to prosper like the eagle. This year we must be serious, very serious. Africa expects it of us.